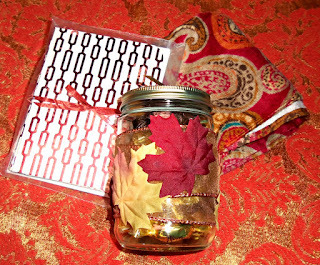 Just a quick post with some very simple fall cards that I had used as birthday cards for my friends who received the decorated jars of candy. I used a variety of DCWV scraps and stray autumny feathers, leaves, and pumpkins for a last farewell to the season. 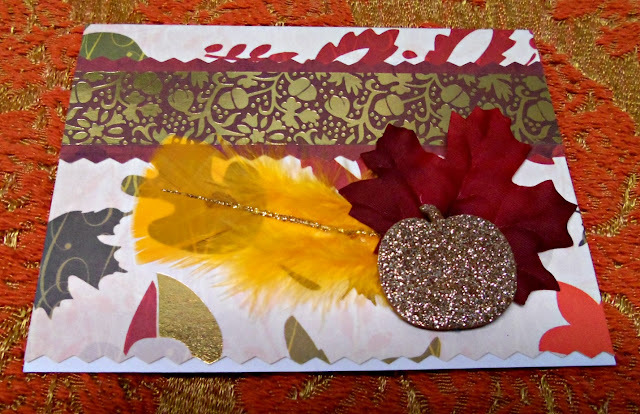 A touch of glitter on the feather and leaves lends a sparkly bit of magic. I love how you can combine any of the motifs in the autumn color family and come out with a pretty card. 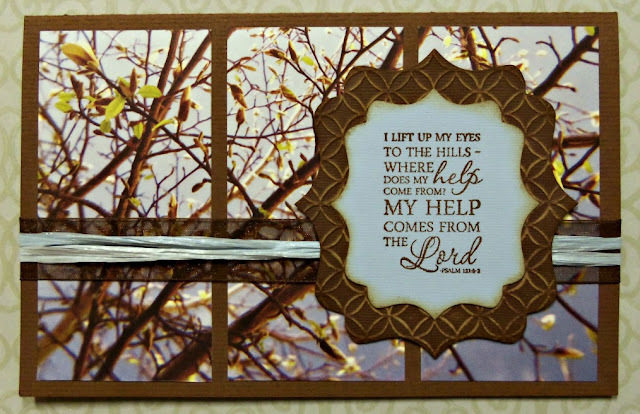 No stamped sentiments on the outside....suitable for any occasion during the season with a quick greeting on the inside. Fan is still on the fritz on my computer, so I have to make this quick. Thanks for stopping by! Wishing those in the USA a Happy Thanksgiving this week!!! The tree and decorations are two different stamps that have been in my stash for so long that I have no idea what company they are made by or where they even came from!!! Eeek! 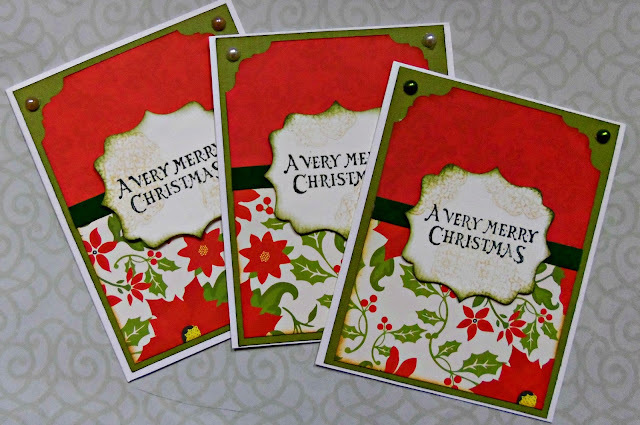 I used scraps from my stash for the red and green panels and heat embossed the images and sentiment. A little bling added just the right festive touch. I better shut things down before my computer fries itself permanently onto my craft table! Yikes!!! A cat village in St. Julians, Malta. All my posts for a few days will be shorter than usual because the fan on my laptop died and I can only be on for a brief time without it seriously overheating!!! I guess my screamin', steamin' blog was too much for my poor overworked fan. Ha! This is the first time I've let her paint with temperas. She had a blast. Kept this very busy and active little gal occupied longer than I would ever have imagined. I knew those toilet paper tubes I had been saving lately would come in handy! 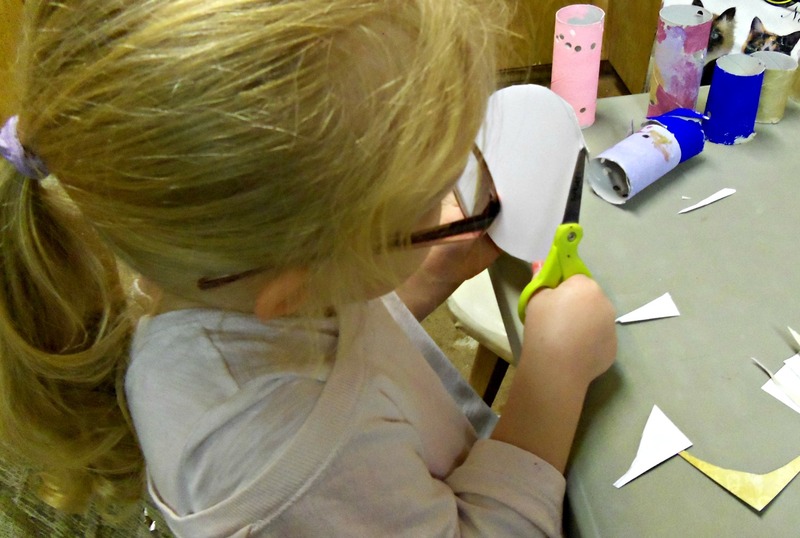 The roofs were circles cut from patterned cardstock she selected from my stash. Oh, joy! Oh, delight!!! 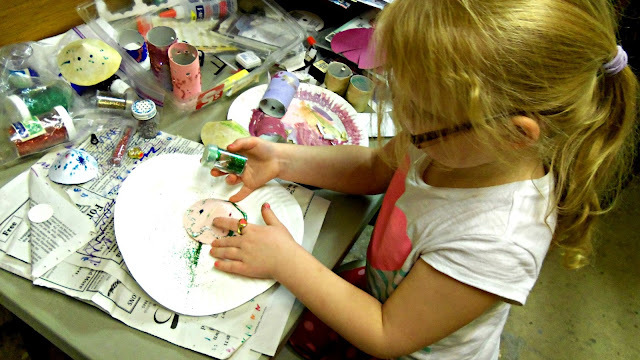 Is there anything more fun than playing with fabulous, shiny, sparkly glitter???? She actually did quite a good job of keeping it contained....considering that glitter is one of the most UN-containable substances in the universe! 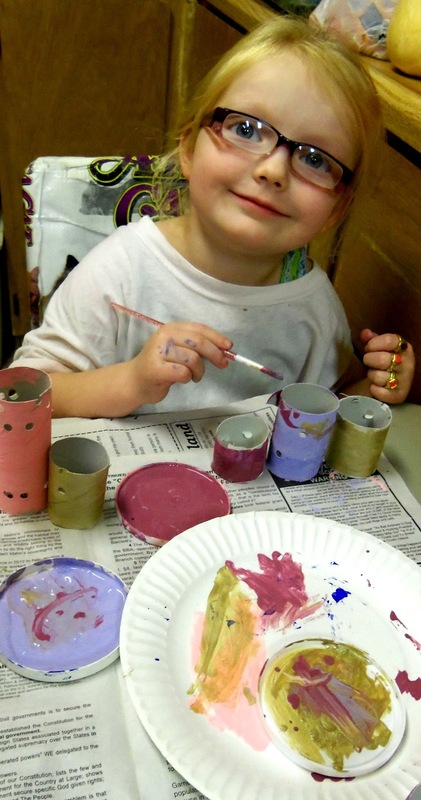 :) Of course, peeling the dried glue off of her fingers was almost as much fun as the glitter, itself. So proud of her little village. She has had a ton of fun playing with it, too! 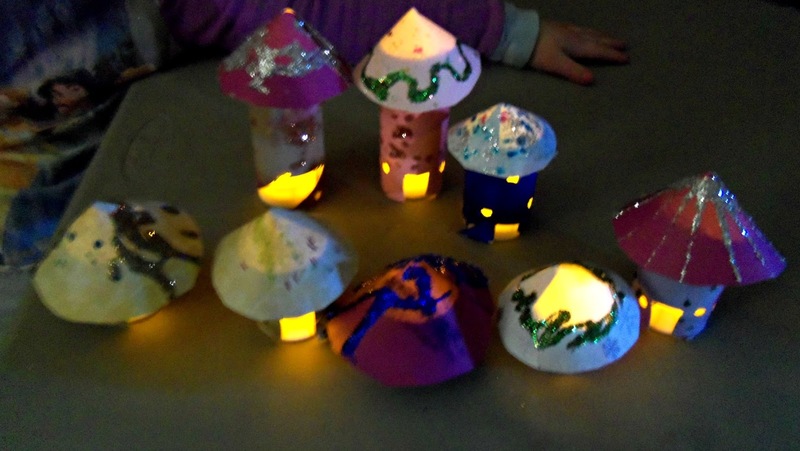 All lit up with those little battery powered tea lights..........MAGICAL!!! Do these look like psychedelic mushrooms to anyone else besides me? Super-fun craft! A big thanks to Jennifer Grace and her Frosty Festivities for this idea!!! Thanks for visiting. I'll be back later with some cards I have been making......after my computer cools down!! 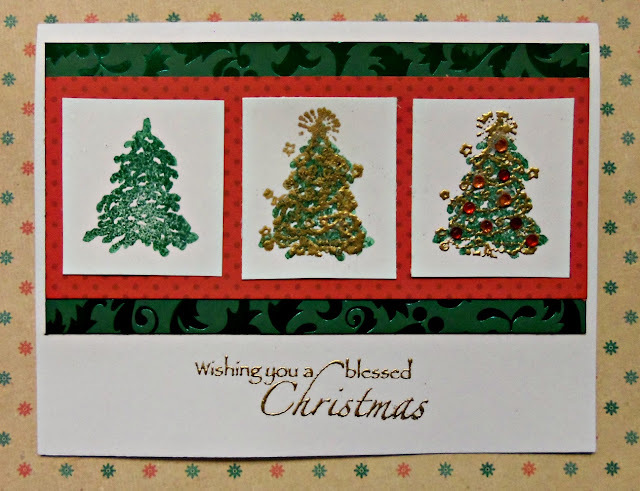 made with inspiration from one of Jennifer Grace's Frosty Festivities 2015 projects here, where she inspired us to use one or both halves of a large stamp separately. 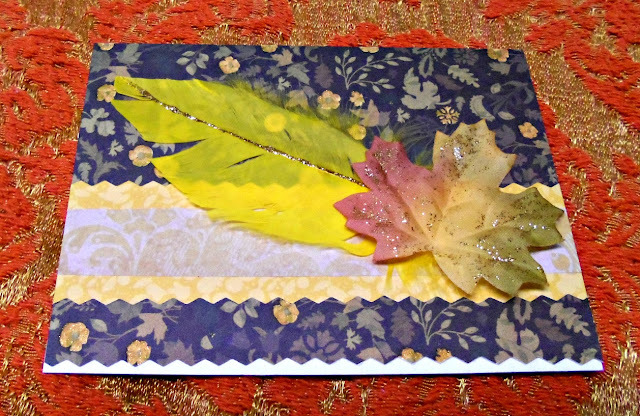 I also am entering this card in the Unity Designer Hop and Friends with Flair Link-Up for this week. There's a big hop and sale over there, so be sure to join us!!! 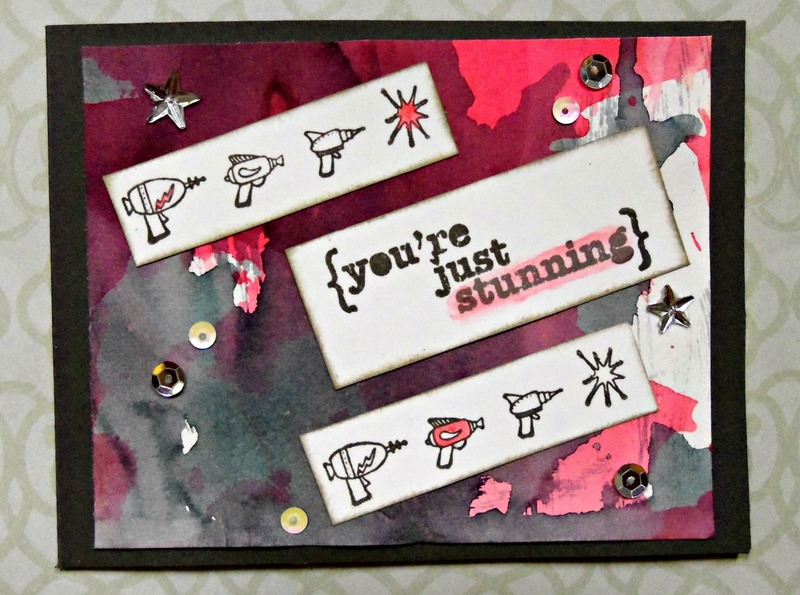 Hope you like this card, too, and that it inspires you to try out CAS....even if it isn't your usual style. 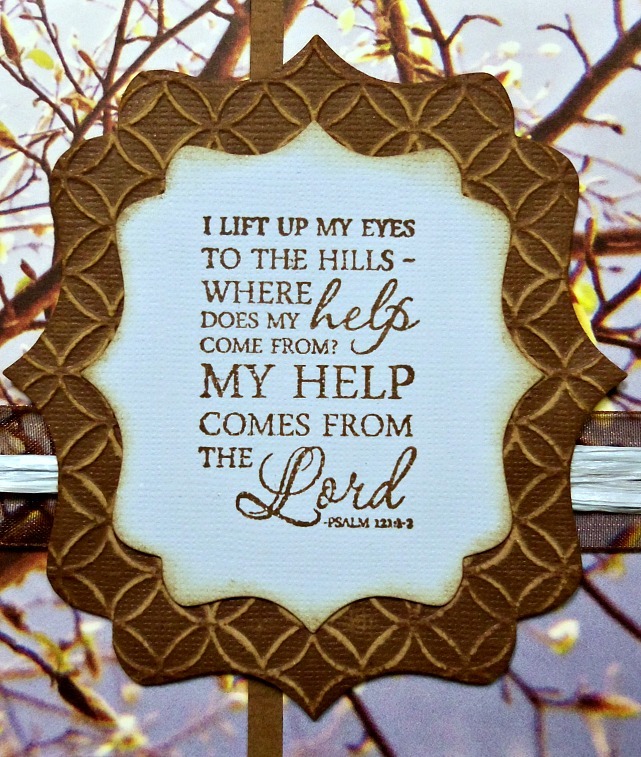 I am here with a sympathy card I was asked to make a while back and hadn't ever posted. It was for a gentleman in our community who had lost two close family members in a short period of time. I made it big enough so it could be passed around at church for anyone to sign that wished to send heartfelt messages. I used a large panel from an old DCWV Photo stack and cut it into three pieces for a window effect. The sentiment panel and mat beneath are scraps that I die cut with my Sizzix - Fancy Labels Dies set. 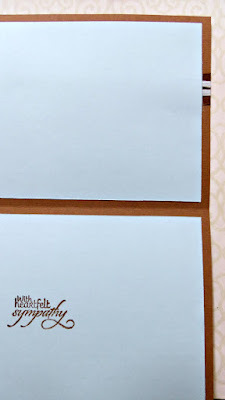 I used Core'dinations cardstock for the mat so I could dry emboss it (Darice - Interlocking Circles folder) and sand it to bring out the design. The sentiment is from my Verve - Scripture Medley 2 stamp set. It was a challenge to use ribbon on the card and still look appropriate for a man. I layered my blue raffia (before I was down to my last scrap!) over some sheer brown ribbon to help it not get lost amongst the busy print. I was pleased with the look for a masculine card. What do you think? The ribbon was wrapped completely around the card front and covered on the inside with a blue liner with lots of room for writing greetings. I really like how the card turned out. 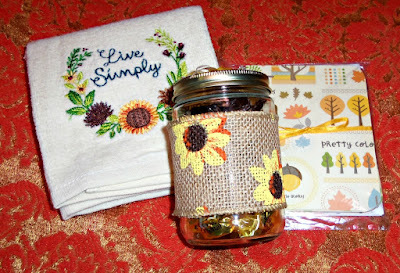 I have been doing a little crafting (in between naps!!) but haven't gotten anything posted for a while. One fun and easy project I worked on recently was a set of autumn decorated jars filled with candy that I made to give to some girlfriends who had birthdays. I used some recycled almond butter jars and wrapped either some burlap ribbon or sheer ribbon around them. (I scored these ribbons at 90% off at Walmart!! Woo-hoo!!) 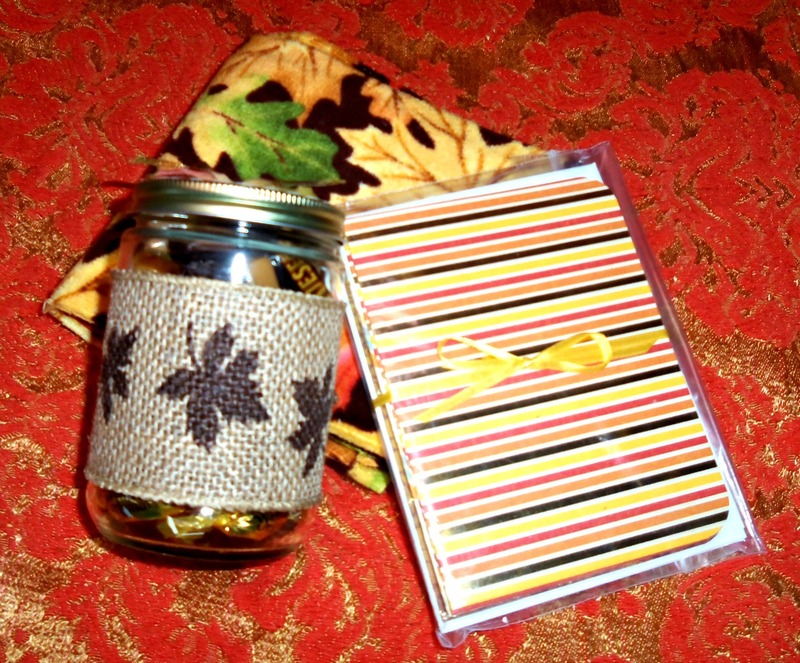 I attached some autumn leaves over the sheer ribbon, but left the burlap ribbon by itself. 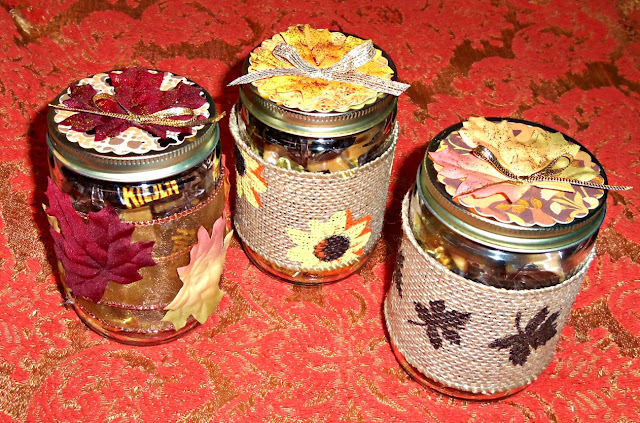 I used my Sizzix - Circles, Scallop dies to cut scalloped circles from some DCWV autumn scraps for the jar lids and topped with some autumn leaves I had glittered and some gold bows. 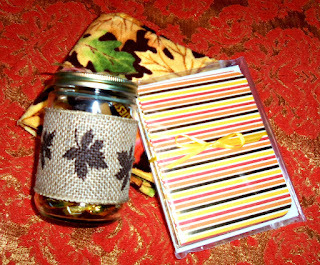 I filled them with some yummy wrapped caramels, toffees, etc. Super easy peasy!!! Thanks for stopping by! I have a bunch of Christmas cards I've been making that need to be blogged, too, so you might be seeing a lot of posts coming soon...if I can muster up the energy!!! 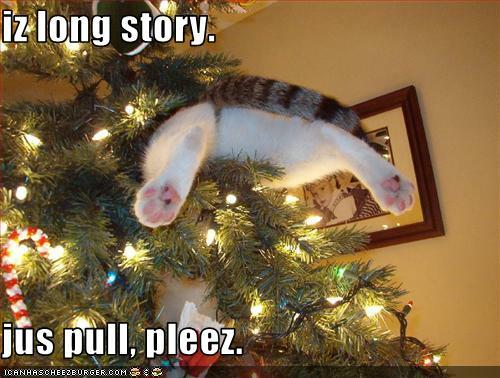 Deck the Halls reminded me of one of the several Cat Mystery series that I enjoy. 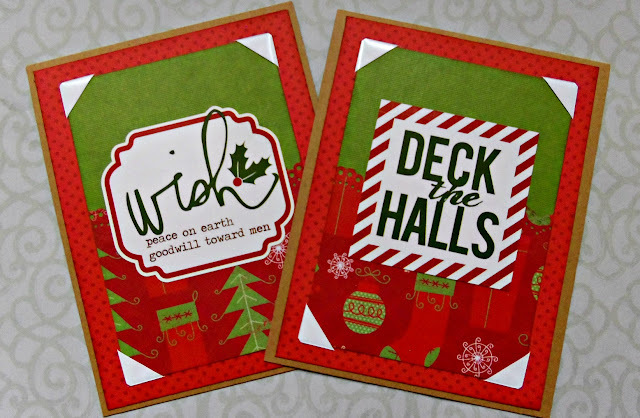 The particular title that came to mind was Cat Deck the Halls by Shirley Rousseau Murphy. I collect cat mysteries in the cozy mystery genre. Do you? Which are your favorites??? I am back with some more half and half cards I made with inspiration from one of Jennifer Grace's Frosty Festivities 2015 projects here. 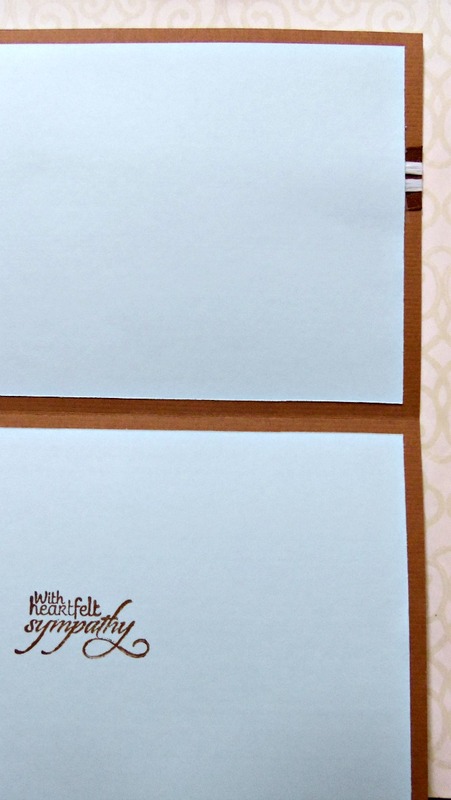 These again have a busy patterned paper in the lower half of the card and the plain solid in the upper half, as I did in this other set. This time, instead of stamping a sentiment panel, I used stickers from the Echo Park - Very Merry Christmas collection to get a more contemporary look. This design is a good way to use scraps, so, again, I was able to use some DCWV pieces from my bag. On the lower panel, I used my Martha Stewart Edger Punch - Doily Lace for a fancy edge. It only shows a tiny bit from behind the sticker panel. I inked the panels with Ranger Distress Ink and added some fun white photo corners that my crafty friend, Karen L., sent me. (Thanks, Karen!!) They were just the thing to tie in with the white of the stickers without adding too much distracting detail. I really love using photo corners in this way. I mounted everything on kraft card bases made from Core'dinations cardstock to avoid too much overwhelming white. 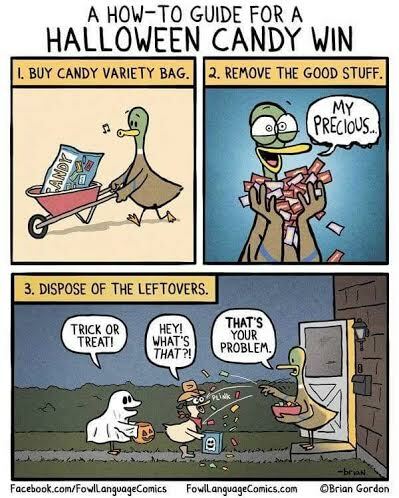 HINT: Ever had your stickers (esp. older ones!) not stay stuck??? I once made a quick baby card using stickers and they were already peeling away before I even had the thing in the envelope!! Eeek. Applying some Beacon 3-in-1 Craft Glue to the sticky backs will keep them stuck where you want them. :) It also has the advantage of giving you a tiny bit of wiggle time to get things positioned properly before it sets. Love that! This trick works well for foam squares, too. I am back with a little set of cards I made, inspired by Jennifer Grace's Frosty Festivities 2015 project here. I was super-inspired by the creative suggestion of using a busy print on the lower half of a project and plain paper on the upper half. 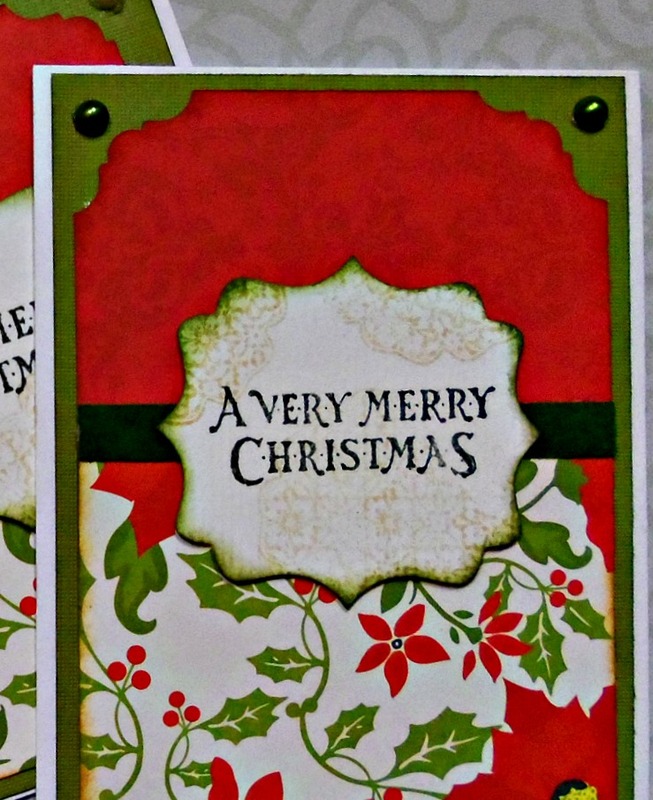 So I used scraps of DCWV papers and a band of green velveteen ribbon for my half and half cards with a classic Christmas look. 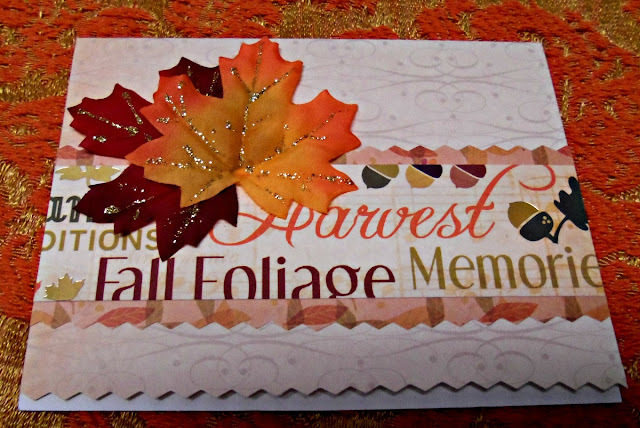 I used an ancient pair of decorative corner scissors to echo the fancy die cut sentiment panel. I couldn't choose which color of pearls to use, so I tried white, Le Creme, and green. I think I like the green the best. Which is your favorite? Wouldn't this be fun to have in front of the house??? 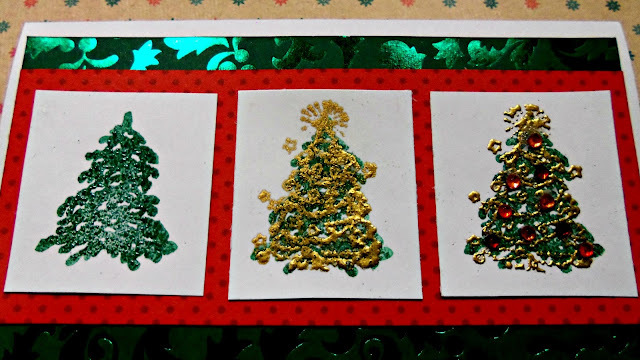 I drew inspiration from this project from Jennifer Grace's Frosty Festivities 2015, where we are asked to fussy cut a Christmas motif. I used a snowman from DCWV paper and put it through a sticker maker to apply to my tag background, which was made from a scrap of DCWV cardstock. 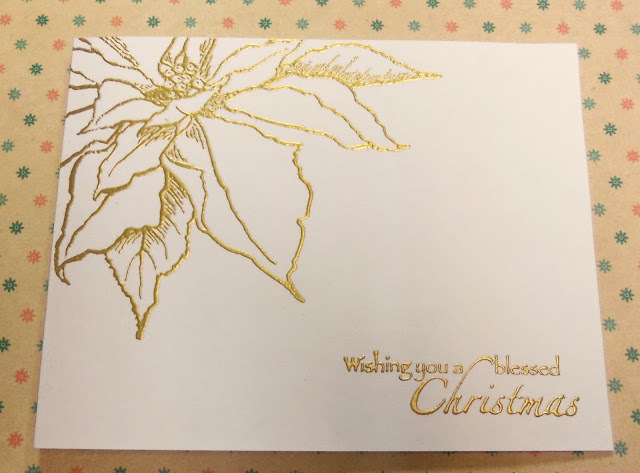 I had way too much fun using the silver tinsel glitter and mica chips from my Stampendous Frantage Encrusted Jewel Kit in silver. I don't know if these little kits are still sold, but I fell in love with the tubes of shiny, glittery little bits of things and had to buy ALL the colors when they came on half-price....lol... I really can't justify that if I don't use them, at least occasionally!! 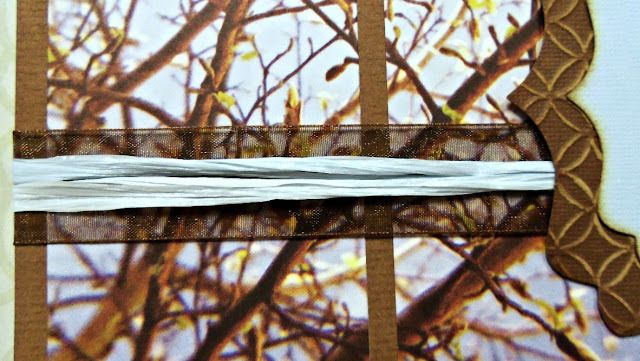 My ties are some baker's twine and the second-to-the-last scrap of some icy blue synthetic raffia that I have been trying to use up for the last several years!!! Here's an angled shot of my tag so you can see more of the mica sparkles. Yum!!! 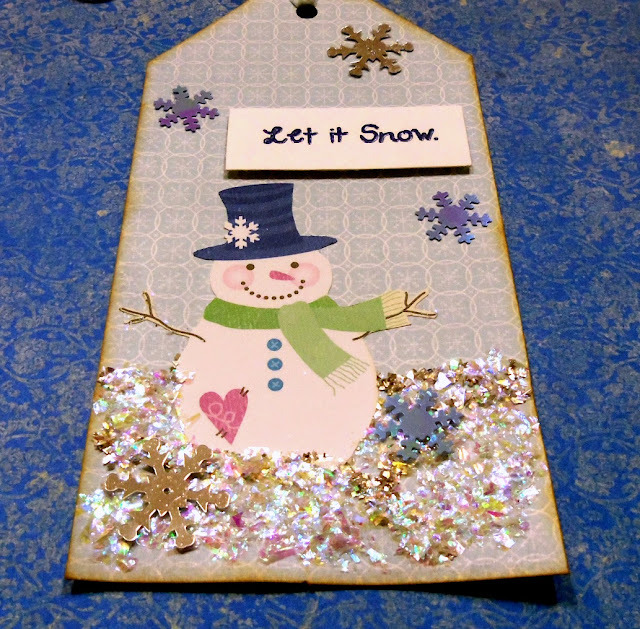 I also added some blue and silver snowflakes and inked around the edges with Distress Ink in Brushed Corduroy. Hope you enjoyed my sweet little tag today. 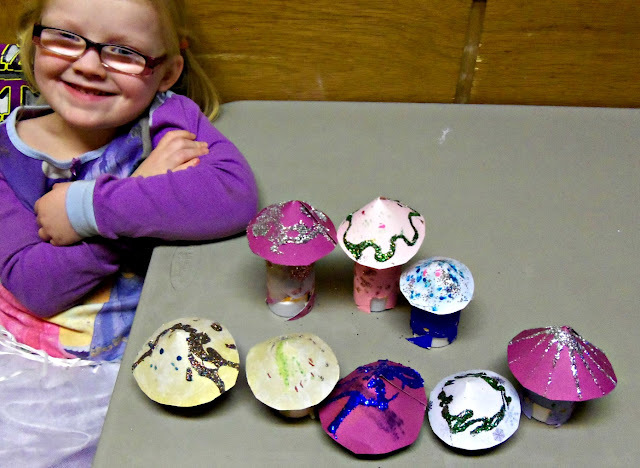 Be sure to check out Jennifer Grace's Frosted Festivities 2015!!! Thank you so much for stopping by and leaving your nice comments. Frosty Festivities is currently in progress........!!!!! This kitty is ready for Frosty Festivities 2015....and so am I, at last!!! 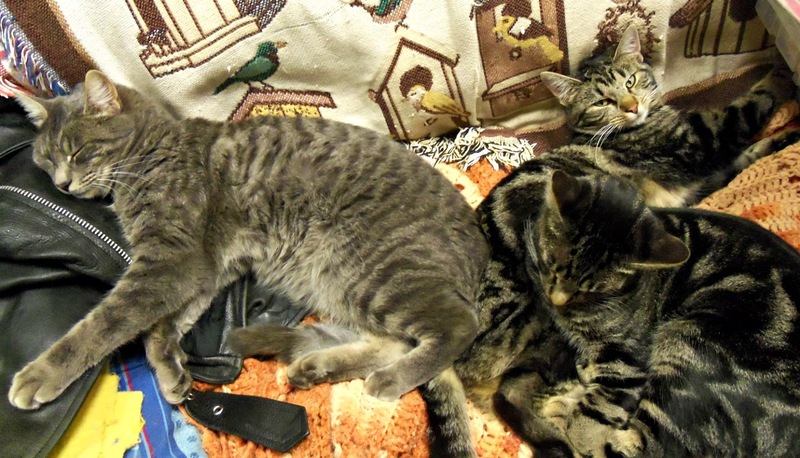 I have the Cat Lovers Hop pretty much put to bed. I still need to hear from a few companies that their prizes are on the way to the lucky winners, but the prizes they sent to me to distribute are now winging their way to the winners. Yay!! 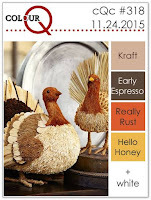 Jennifer Grace's 2015 Frosty Festivities!!! I am getting started late because of my Cat Lovers Hop, but I wanted to let you all know about this wonderful event that Jennifer Grace hostesses during the holiday season. This year it is even bigger and better because it lasts ALL through November!!! Woo-hoo!! 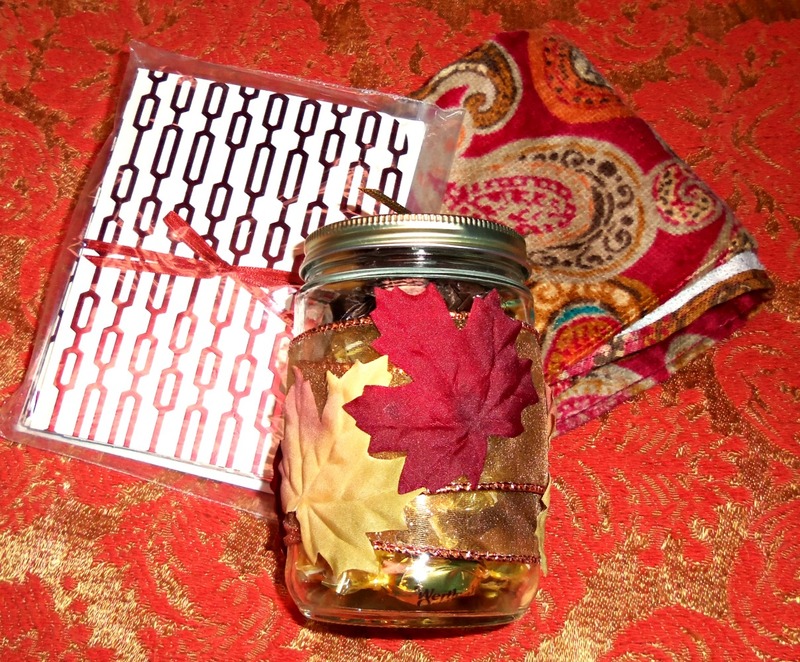 She has fun challenges, giveaways, and tons of inspiration for holiday crafting. I hope you will join me in participating!! Well, did we have fun last week with all the stunning photos of everyone's projects and kitties?? I sure did. I did only the simplest of watercoloring with only one color and added some sequins and rhinestone stars to the background. I love how fun and playful it turned out. What do you think???? At least the Link-up gadget for the hop worked flawlessly. I didn't lose anyone's projects or catastrophically delete the entire internet or anything. (Although my hubby might not have been too sad if I had made the internet disappear! Ha.) So, that part was good. I would so rather lose my post than lose something of yours!!! Okay....you probably want the real list of winners not just "***[Insert list of winners.]" Am I right? Okay..........here we go.....again................All winners were drawn using Random.org. 1. Graphic 45 package: D.Anne C.